A Turing Test – the biggest ever staged, according to New Scientist – took place on 23rd June at Bletchley Park to mark the Turing centenary. The test involved 150 conversations, 30 judges, 25 humans and five chatbots. The article points out that the Loebner Prize typically involves four judges and four chatbots. The contest was won by ‘Eugene Goostman‘, “a chatbot with the personality of a 13-year-old boy” which fooled judges 29% of the time. The Action This Day! campaign, to raise the £2.4 million needed to unlock £5 million of Heritage Lottery funding, has reached its target. The funding means that the Park can “commence urgent restoration of the profoundly historic, yet currently derelict, Codebreaking Huts 3 and 6, and the development of a world-class visitor centre and exhibition space in WW2 Card Index building, Block C”. However, this is no reason to stop giving. There is a long way to go to fully “transform Bletchley Park into a world-class heritage and education centre to adequately reflect the profound importance of its impact on WW2 and the twentieth century”. The Bletchley Park Trust will immediately embark on a fundraising campaign, expected to be in the order of £15 million for the next phase. Source: Restoration Lifeline for Bletchley Park’s Iconic WW2 Codebreaking Huts Coincides with Turing Centenary. Today is the 100th anniversary of Alan Turing’s birth. Turing did not just one but several hugely important things during his life, none of which were properly appreciated while he lived or for a long time after he died. In the run up to his centenary, a campaign to make people aware of Turing and the enormous impact he made on so many fields, and most importantly to clear his reputation, has been more successful than anyone could have hoped. Turing is now rightly recognised as one of the greatest mathematicians of the twentieth century, as a victim of persecution, and as a war hero. The Turing Centenary campaign has been so successful that we’ve decided there’s no need for us to write a biography of Turing, or to highlight some obscure thing he did, or really anything. Literally hundreds of pieces have been written, by some of the greatest writers and thinkers in the world, covering every detail of Turing’s life from his school days to his more obscure mathematical work, up to the circumstances leading to his suicide. So instead, we’ve collected together some of the best exposition, reporting, and creative expression we’ve found to commemorate the life of Alan Turing. 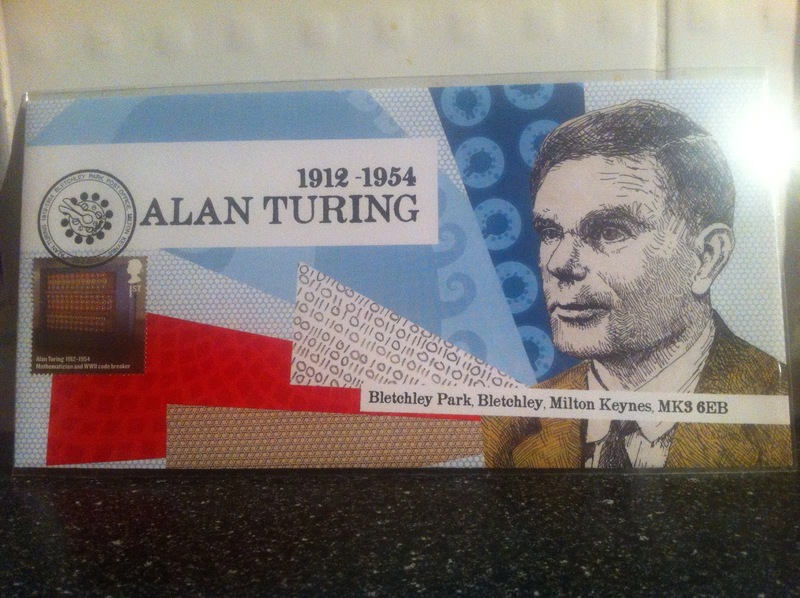 For my recent birthday I was given a wonderful present: a special UK stamp commemorating Alan Turing, who was born 100 years ago today. The stamp was issued by the Royal Mail not for the Turing centenary but as one of a series of special stamp sets to mark the Queen’s Diamond Jubilee. This stamp is particularly special because it is one of 1000 which originated at the Bletchley Park Post Office that were stuck onto a specially designed envelope (Turing, mathematics and patterns) and cancelled on the day the stamp was issued, 23 February 2012, using a special Bombe-themed postmark. Historical anniversaries: are they worth celebrating? It probably hasn’t escaped your attention that this year marks 100 years since Alan Turing was born, and that the actual anniversary of his birth is tomorrow. There is massive interest in this fact, both from specialist maths and computing outlets and the mainstream press. What, though, is the significance? You don’t need me to tell you that any anniversary is fairly arbitrary. The earth has gone a whole number of times around the sun since the event (within some margin of error). What, really, does this mean? And attributing special interest to one particular number of anniversaries just because it is a factor of ten or a neat fraction of one hundred is wholly meaningless. So I don’t fall for anything like that, right? Wrong. For a couple of years now I have been tweeting a link to a biography of a mathematician who was born or died on each date to the Twitter feed @mathshistory on behalf of the British Society for the History of Mathematics. This generates some interest and I am delighted when it does so. So can I justify anniversaries as having some tremendous significance or is this all just a cynical attempt to grab attention? To a great extent it is the latter. BSHM have a charitable aim to “promote and develop for the public benefit, awareness, knowledge, study and teaching of the history of mathematics”. If anniversaries are going to generate greater awareness of and interest in history, then I’m in. For the daily tweeting I rely entirely on the excellent MacTutor History of Mathematics archive (so much so that some people think I run the site, or MacTutor runs the Twitter feed). The basic ground rules are: one tweet per day, each mathematician once per year. This causes some conflicts that people don’t naturally understand. For example, on 23rd January I tweeted about James Lighthill, who MacTutor describes as “one of the foremost English applied mathematicians of his day”. Why, wondered Twitter user @gemmarobles, was I ignoring David Hilbert, also born that day? Well, I included Lighthill on his birthday because he died on the same day that Lexis was born, who MacTutor report as “initiating the study of time series”. And Lexis died on the day Galois was born. And although there are a few mathematicians who were born or died on 14th February, when Hilbert died, there is no clear issue with placing Hilbert on that day. So why did I choose Lighthill over Hilbert? Because Galois was born on the day Lexis died. At some point, an arbitrary decision needs to be made and this has consequences down the line. Apart from these basic constraints, I have a bunch of extra rules. I am doing this to try to generate interest, so I try include some variety. I like to try to tweet from different eras and different mathematical areas on adjacent days if possible. I favour time periods when few dates are known or cultures without many mathematicians in the database because these have fewer opportunities to get picked. I also think it is good to highlight women in mathematics or other important issues such as race or disability, again if possible. It is also pleasing to make people aware of the mathematical contributions of mathematicians who are better known for something else, or people who were not principally mathematicians but made a contribution. Anyone who meets some of these criteria might see favour over other mathematicians associated with the same day. Still, much as I like to include mathematicians that people won’t know and highlight time periods and issues they haven’t thought about, it is the big hitters, Euler and Gauss and other well known names, who get the large numbers of retweets and interest. So I include them because that is how followership of the account grows and links to maths history content spread. If people are only going to take an interest on a famous anniversary, at least they are taking an interest at all. Do I think the world has gone over the top on Turing? I do think there is value to be had. Leveraging Turing’s name and the interest generated by his centenary to attempt to do some good for gay rights is a noble undertaking (although I have my doubts over the precise details). Using Turing to try to generate extra interest in the history of mathematics, cryptography and computing is worthwhile. If we aren’t going to get people’s attention at the big 100, when will we? I remember seeing a lecture by Robin Wilson where he lamented the relative lack of interest in the 300th anniversary of Euler’s birth in 2007, which could have been a great opportunity to raise the profile of mathematics in wider culture. It’s clear to see why the 305th anniversary this year just hasn’t got the same traction. However, I worry about the others involved with the war work at Bletchley Park or the early development of computers who are getting eclipsed, and, for that matter, all the other history of maths and computing stories that are worth telling but can’t get the attention. Celebrating the big names supports the idea that advances are made in giant leaps by great men (mostly men), whereas history is constantly being made in small steps. On top of this, I worry that the attention people are giving Turing is fairly superficial. People aren’t, I think, gaining a wider understanding of the historical context into which Turing fits, or of the place of mathematics research in our culture. And I worry that this interest won’t be sustained. What happens in the cold light of Sunday morning when it’s all over? Perhaps we can sustain some interest until the end of the centenary year but will ‘Turing100’ have a lasting impact on people’s minds? Turing died in 1954. Will we ignore him again until 2054? Anyway, must dash. I have to draft my exciting Turing centenary day post for tomorrow. The Turing Solution, a BBC Radio 4 documentary presented by Matt Parker covering “mathematician and code-breaker Alan Turing, and his role in the invention of the computer”, was broadcast last week and is currently available on BBC iPlayer. A quick (28 min) biography covering various aspects of his life and work (particularly including his mathematics and work in early computing), with a wide range of interesting contributors, this is well worth catching. James Grime has come out in support of the campaign to put Alan Turing on the £10 note. He explains about this in a new video.